This version mainly adds the missing libraries that made many features in 5.1.1 not work correctly, so the release notes are short. Learned lesson, this version will be label beta. Do not install if you are in the middle of a project. Added: support for the 3D video mode of the Fujifilm FinePix W1/W3 into the FirstLight 3D Muxing tool. Fixed: adding the missing Microsoft and Intel redistribution libraries to make it all work better. If something doesn't work that did work in 5.1.0, that might be another library we missed. Please report any such findings to support, and we will turn the fix around quickly. What is the latest version BEFORE you moved to the new development environment ? 5.1.0 was the last release under the older dev. tools. The new tools are much better. If you are compelled to get new features and bug fixes mid-project, there is little risk as can always go back to an older version. Anyone care to comment if 5.1.2 is working better for them? NLE Sync is working fine for me. I am getting the occassional stack hash error message from Firstlight which then closes when either cycling through my clips in a list in Firstlight or about to ctrl+v paste a look I created for a clip. I am using the NEO4k on Windows 7 64bit. If you have a repeatable proceedure for that error, please send it to support. Otherwise it seems we have improved things. But it doesn't successfully load the CF AVI files! 1) If I open an existing project containing CF AVI files, *some* of the AVI files are listed as Offline. If I try to link them to the original file, it says they are not of the same type. If I close the project without saving it, and reopen it... different files will be effected. 2) If I create a new project (using a Prospect 1920x1080 30F preset), containing CF HD AVI files, *some* will load properly, and will show in the project window as Video files with audio. Others, will show as Video files with no audio! All of the files were converted from MOV to CF AVI at the same time, using the same version of HD Link. If I preview a Video without audio file by selecting it, then clicking the play button in the Project window, there is no audio. If I play it in Windows Media Player, there is audio. When I go back to 5.1.0.268, everything loads properly. As I'm CS3 finding is working fine now, we have to determine what is making is random on your system. Bugs normally don't behave that why. More likely there are two components, one that works and one that doesn't Premiere is using both (the strange part.) Uninstall 268, the search in C:\Program Files (x86)\Adobe for any files with this pattern *CFHD*.prm and delete any that remain. Reinstall 271, see if it is now working. I repeat...I was totally blown away! It was the smoothest playback experience I have ever had on that old system that has a very large and complex project on it at the moment . I did not have time to fully test things, but if nothing serious shows, this "beta" is very different, very fast and very smooth. What did you guys do that made such a difference? I even changed to full resolution playback and it was smooth as silk, almost like I was using our CS5 workstation! Even scrolling back and forth and using the Bella wheel on the keyboard of that system was smooth as I have ever seen it run. Whatever you did different...KEEP DOING IT! I retract the grouching on the last beta! All is much better so far. One comment on Julian Frost's post: One CS3 system of ours did exactly the same thing as his, but when I closed that project without saving and then reopened it, things were totally normal and quite smooth. I haven't checked the other to see if the behavior was the same. I deleted the files, and installed 271. Same problem: Random AVI files are loaded as if they do not contain audio. Attached are some screen shots. The first one is an existing project, as opened the first time. You will see there are 2 AVI files on the timeline which were not imported correctly. I closed the project, and opened it again. 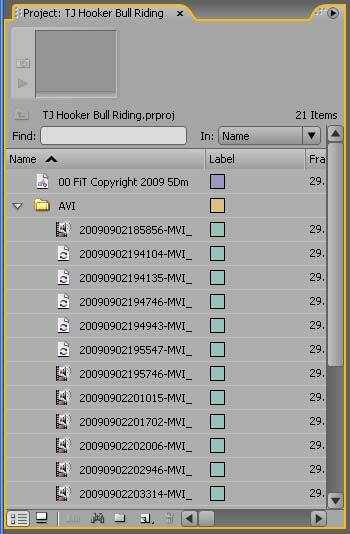 As you can see in the second timeline, there are 6 AVI files which were not imported correctly! I included a shot of the project window so you can see how PPro CS3 sees these files. Again, this is the same project, opened once, closed, and then immediately opened again. This random incorrect importing happens on every project I open. I went back to that same system, as I couldn't believe what I was seeing. It's true, but alas...all is not well in beta-land. I decided to push it with a little Premiere prob that has plagued us in the past. We had a whole track of black video below all the video in that project, due to the red prob. When I re-activated the black video and then re-rendered the few sections that had transitions to black, it crashed Premiere repeatedly after a minute or two of rendering. I will reload the 5.1.0 again and see if this behavior is still present. Same prob in 5.1.0, so it could be something else. Might have nothing to do with the beta at a all. Will try to work through this tomorrow. It looked suspiciously like some old CS3/CF mem probs of the past, so I killed all non-essential processes, to free the maximum physical memory, and sure enough, it rendered no problem. It came very close to using every bit of free memory on that old system with only 4 GB RAM and Win x64, but managed to keep it's head above the water to the end. Looks like purely an old CS3 memory prob that even Win 7 x64 couldn't pull through without help. Jack that mem up to 8 GB and it'll probably be fine. Just a quick update...it's late. The newest beta apparently uses quite a bit more free memory, but I'll try to verify that later tomorrow. If so, that would explain the CS3 crash on that system. Is that why the playback is smoother? I downloaded the 5.1 demo and I cant even get it to run. I dont feel like going back through the reg process to see if 5.12 runs. There is no registration process, just download directly from the links in the first post of this thread.